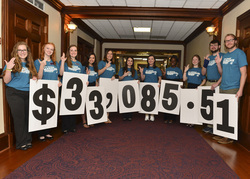 Stephen F. Austin State University students raised more than $33,000 during the annual Dance Marathon. All proceeds will support pediatric programs at Christus Trinity Mother Frances Health Systems in Tyler, the only designated Children's Miracle Network hospital in Northeast Texas. Pictured, from left, are Avery Hager, Katy psychology and biology major; Rachel Ballback, The Woodlands health science major; Camarin Guillory, The Woodlands mass communication major; Alicia Ybarra, Fort Worth psychology major; Carly Nichols, Belton psychology major; Ireland Bramhall, Ennis hospitality administration major; Melanie Burnell, Wylie business major; Emmanuella Adegbola, Ogun State, Nigeria, biochemistry major; Lillie Zech, Jacksonville, Alabama, chemistry major; Aaron Baker, Vidor mathematics and computer science major; and Colby Norton, Atascocita rehabilitation services for the deaf and hard of hearing major. NACOGDOCHES, Texas - It began as a lofty goal: raise $23,000 for the Children's Miracle Network. Many told them this couldn't be done. Many suggested lowering their goal to a more feasible number. But after a year of fundraising, Stephen F. Austin State University students raised more than $33,000 through the annual Dance Marathon - surpassing their initial goal by more than $10,000. "Our students seriously considered lowering the goal this year, but they decided The SFA Way, an honor code grounded by five principles for personal excellence, compelled them to strive for excellence in everything they did and kept the goal," said Dr. Adam Peck, dean of student affairs. "The fact that our students surpassed their goal shows them the value of their hard work and passion. I truly believe this experience will be something they remember for the rest of their lives." Dance Marathon is a national movement encouraging students to engage in peer-to-peer fundraising with proceeds benefiting Children's Miracle Network hospitals. SFA's proceeds will go to Christus Trinity Mother Frances Health Systems in Tyler, the only designated Children's Miracle Network hospital in Northeast Texas, and will support its pediatric programs, including the neonatal intensive care unit and special needs clinic. More than 670 students participated in fundraising, which included selling concessions at basketball games, partnering with local businesses for profit sharing, hosting events on campus and encouraging a fundraising competition among SFA's Greek organizations. Each person who registered as a dancer had an online fundraising page. Molly Moody, assistant director of leadership and service who helped oversee the Dance Marathon, said 70 percent of the funds raised came from peer-to-peer fundraising. "The primary goal of the Dance Marathon is to raise awareness and then to celebrate, in unity, our success and impact as Lumberjacks," Moody said. At the end of the campaign, SFA held a celebration on campus to reveal the final total and celebrate with the Nacogdoches and university communities with games, food and dancing. "I have been watching the number rise all year, and the last the students knew before the final reveal was that they had raised a little more than $17,000," Moody said. "Watching them learn they completely superseded their goal was a magical moment." More than 300 students danced at this event with many dancing for lost loved ones or to make a difference in the world. "I didn't know why I danced really until the day of the event. It was one of the most fulfilling days of my life," said Carly Nichols, psychology major from Belton, Texas. "Being able to raise this much money for so many kids is amazing." Camarin Guillory, mass communication major from The Woodlands, said dancing inspired her and it was a "a privilege to dance for such a great cause." Three years ago, SFA held its first Dance Marathon and raised about $8,300. The second year students raised around $7,400. For more information about SFA leadership programs, visit sfasu.edu/studentaffairs.